Talk to your neighbor about your barking dog before it becomes a problem. No one wants to be a bad neighbor. Unfortunately, you can find yourself labeled as one quickly if you have a dog that disturbs others. While you work on your dog's manners, it can help to have a talk with the neighbors about the situation. Know the laws. Before heading over to talk with your neighbor, familiarize yourself with the local laws pertaining to noise and whether barking dogs are addressed. Your city or county government can point you in the right direction, but if you live in a neighborhood with a homeowner's association, their rules will apply, too. Explain the situation. 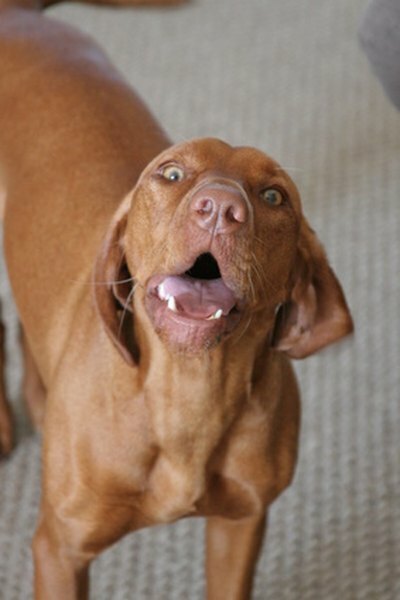 If your dog is barking because he is young, bored or anxious, detail what you are doing to solve the problem. Whether you are increasing the amount of exercise you provide or working with a licensed trainer, let your neighbor know that you understand the problem and are working to resolve it. Lay out the details of the law, if you are sure you are not violating them. This lets your neighbor know that you have done your research and are taking the issue seriously. If you think your dog may be violating noise laws with his barking, avoid bringing the subject up, but be prepared for your neighbor to. Describe situations where your dog might bark normally. Some noise in a neighborhood is normal and to be expected. Dogs bark as a greeting, to warn of intruders and if being teased by animals or people passing by. Barking is one of the ways dogs communicate. This type of barking is to be expected and your dog will typically quiet down when the moment passes. Ask what is important to your neighbor. Be willing to compromise. If your neighbor goes to bed early, maybe you can walk your dog in the evening rather than let him out in the yard unsupervised. If your neighbor works from home, consider hiring a pet walker to exercise your dog during the day so your neighbor isn't subjected to hours of barking when you're not home. Remain calm. Regardless of how the conversation is going, don't get defensive or angry. You might have to agree to disagree. Thank him for his time and head home. Arguing or acting badly only will strain relations further. Even if you cannot control your dog's barking all the time, be a good pet neighbor. Pick up your dog's messes, don't let him roam free and don't let him bark at or harass other people or animals. Does a One-Eyed Cat Need Special Care? Can Different Species of Parrots Be in the Same Cage?